In this image the top of a given colored region is defined by a noise function, and the same color is extended downward. As each new color is used, the "baseline" is moved up by a fixed amount, giving this view of jagged "mountain ranges". Halfway through the image the colors are abruptly changed from tree tones to blue-and-white for clouds in a sky. Rather abstract, but it does seem to appear to be "mountains" and cloudy sky to the average viewer. 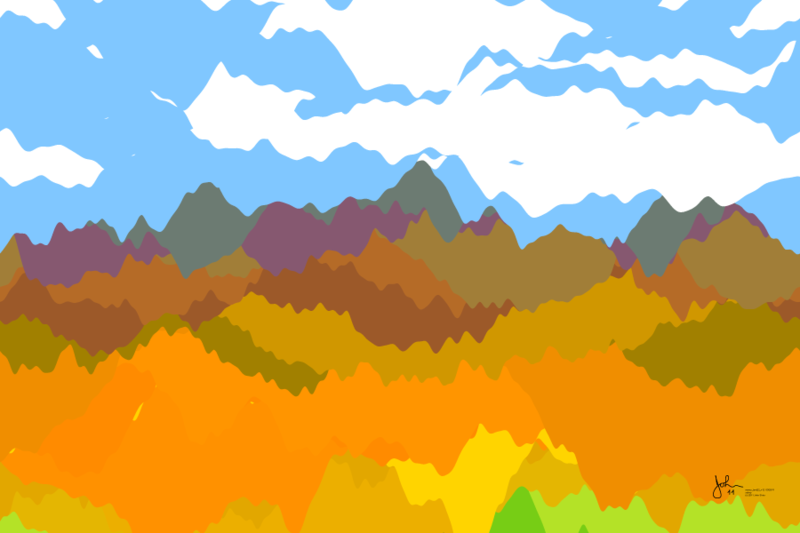 The succession of foliage colors is generated by random walk, and in this case is autumnal in hue. The use of random walk to find the colors ensures that no two successive colors are very "distant" from each other in color space.